Gardeners love the potato plant (Solanum tuberosum) for its underground root tubers, with the University of Florida Institute of Food and Agricultural Sciences declaring it as America's favorite vegetable. Because the portion of the plant that's harvested is completely underground, providing the potato vine with optimal soil conditions can help improve the size, quality and volume of the potato crop. Soil texture can be divided into three major types of soil: sandy, loam and clay. The best texture for potatoes is well-drained, fertile loam, according to UFIFAS. Improve clay or sandy ground with organic matter, like aged compost, until the soil is crumbly and loose in texture. Potatoes are a cool-season vegetable crop and are typically planted during the spring. The plants experience optimal growth when the soil temperature ranges between 60 and 70 degrees F, according to the University of Illinois Extension. When soil temperatures surpass 80 degrees, the potato tubers stop growing. Potatoes grow best in soil that has a pH of 5.0 to 5.5, according to Ohio State University Extension. If the pH ranges below or above this, potato diseases, like scab disease, may afflict the underground tubers. Some garden stores and nurseries sell soil-testing kits. Soils with too high of a pH can be lowered by adding amendments like sulfur, ammonium nitrate and urea, while low pH levels can be increased with lime. The specific amount needed varies according to the current pH levels. Contact your regional cooperative extension service for guidance on amendments and application rates commonly used in your gardening area. When planting the seed potatoes, each seed potato must be given adequate soil space to allow for optimal plant development and tuber production. The University of Illinois Extension recommends spacing seed potatoes 1 foot apart. If you're growing more than one row of potatoes, space each row 3 feet apart. Fertile soil gives the potato plant the energy it needs for vigorous growth of vegetation and encourages plump potato tubers. Use a standard 10-20-20 or 8-16-16 (nitrogen-phosphorus-potassium) all-purpose garden fertilizer. Apply the fertilizer at a rate of 2 1/2 lbs. for every 100 square feet of gardening space, according to Ohio State University Extension. 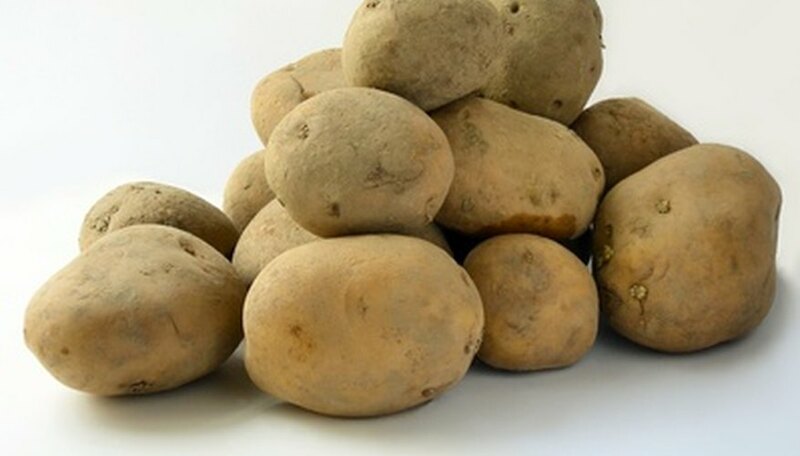 The university suggests spreading the first application of fertilizer before the potatoes are planted and again when the potatoes are approximately 4 inches tall.